Callum Stead’s double saw Luton Town’s academy squad enjoy a fantastic 4-0 victory over Evo-Stik Southern Premier Division side Dunstable Town at Creasey Park last night. 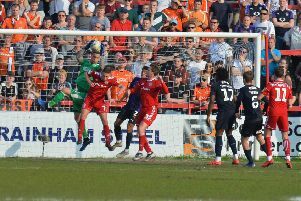 Luton took the lead in the 10th minute, when Jack James made a surging run down the right and crossed for Stead to volley past Garry Malone. Dunstable had a great opportunity to level 11 minutes later, when Ryan Young was put through one-on-one with keeper Tiernan Parker who saved well, Ciaren Jones completing the clearance. Andy Awford’s side made it 2-0 midway through the half when Stead pounced on an error from Malone who dropped James’ cross, the forward slamming into the net from close range. Scott Belgrove was next to have a go eight minutes later as his 20-yard effort struck the underside of the crossbar and somehow didn’t cross the line. Five minutes before the interval, the Blues came close to halving the deficit, Brandy Makuendi’s curling effort wide. The visitors didn’t let up after the break, as just five minutes in Read calmly curled the ball into the top left corner from the edge of box to make it 3-0. Town rang the changes on the hour mark and had their fourth when substitute Josh Neufville powered home an emphatic finish 13 minutes from time. Awford’s side are next in action – at the same venue – this Friday, when they take on AFC Dunstable in the Bedfordshire FA Premier Cup final. Hatters: Parker, James (A Jones 60), Mead, C Jones, Byron (Panter 60), Peck (Swindells 46), Belgrove, Sorunke, Read (Richardson 60), Shamalo (Tomlinson 60), Stead (Neufville 60).